ministry to the nation of Israel. Tiberias and the Jordan Valley. of the Sea of Galilee for the Nigerian Pastor to organize meetings for international pilgrims. Joshua explained, adding it was not a decision he undertook lightly. will establish your faith,” he further clarified. that this ‘treatment’ had led him into a life of virtual isolation. of love. You show hatred; I show love. ministry from afar before inviting him. area relying on the church activities for their sustenance. 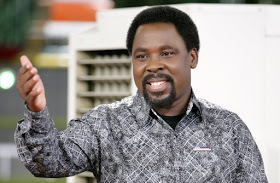 0 Response to "BREAKING:I am Leaving Nigeria, And Relocating My Ministry To Another Country' - TB Joshua"